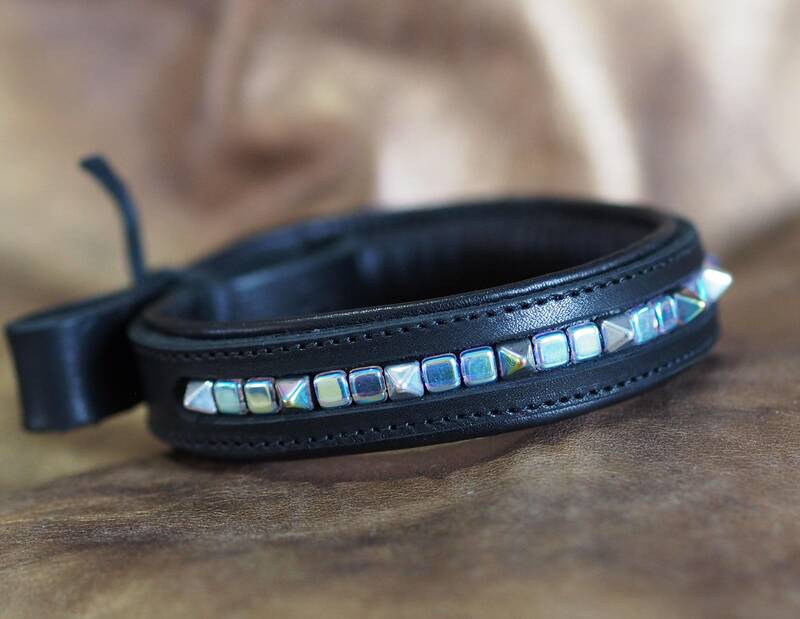 This leather dressage/show brow band is subtle bling--softly iridescent Preciosa brand beads, a mix of flat squares and unique pyramids to create an edgy style, but with more subtlety than metal spikes or flashier silver or chromed elements. 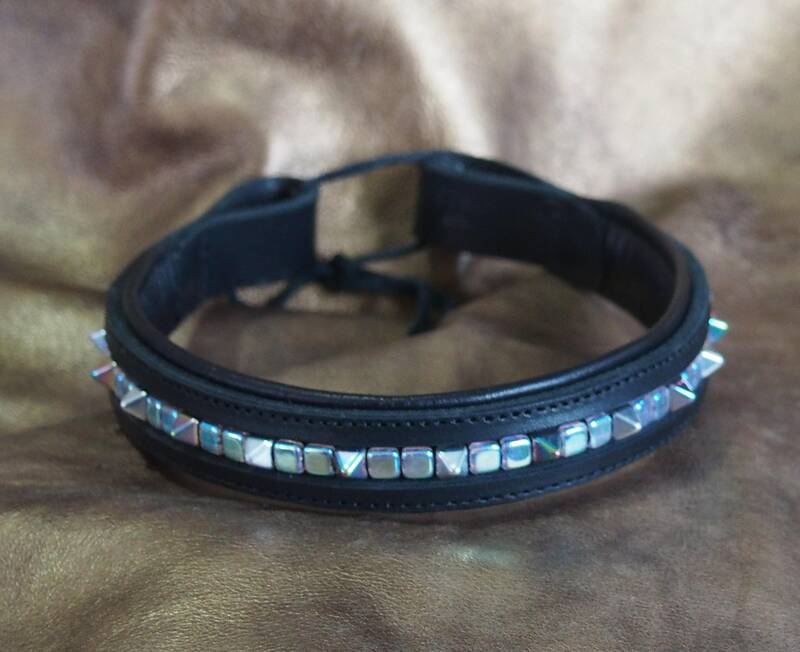 This particular combination is more suited to English tack than western, but I have other leather and bead colors if you want to match something! 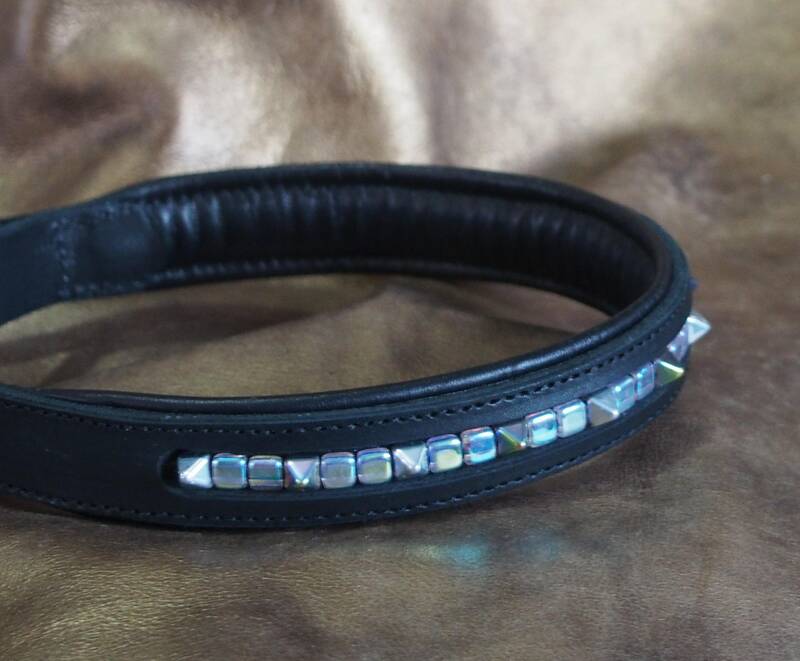 The brow band is made with black cowhide main band framing the beads that are strung with strong bead wire and stitched to strong goatskin strip, which is then layered under the cowhide so the slot only shows the beads themselves. 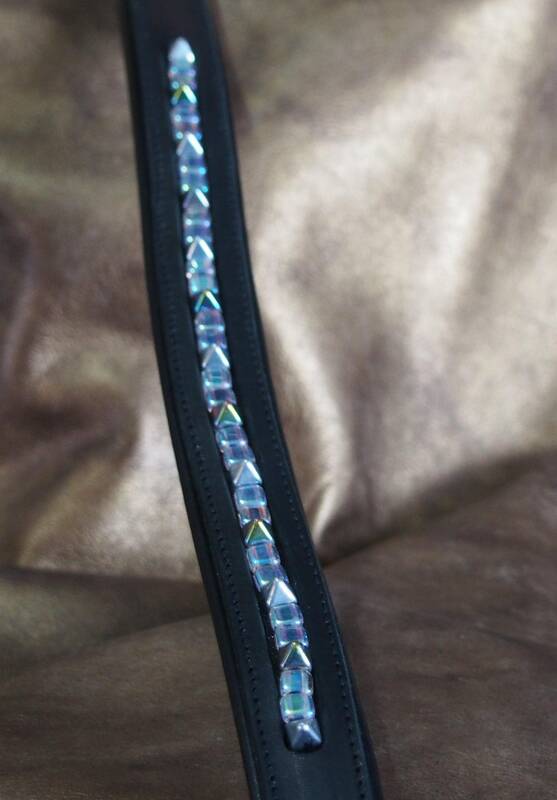 The band is top quality cowhide, 3/4" wide, though opens up to 1 1/8" to reveal the 10 1/2" long strip of square silver sequin ribbon. 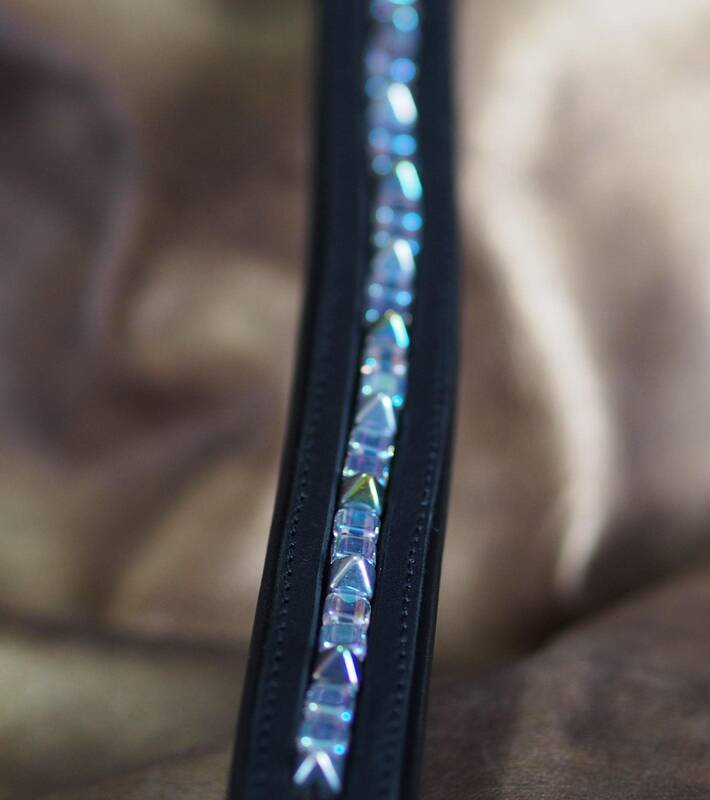 Fine black lambskin is wrapped around Landau padding, and the width extends about 1/8" on either side of the main cowhide to provide a soft edge reveal, and more comfort for the horse. All layers are then stitched together and ends of the lambskin are overlapped by the ends of the cowhide which creates the loops, for a smooth transition. 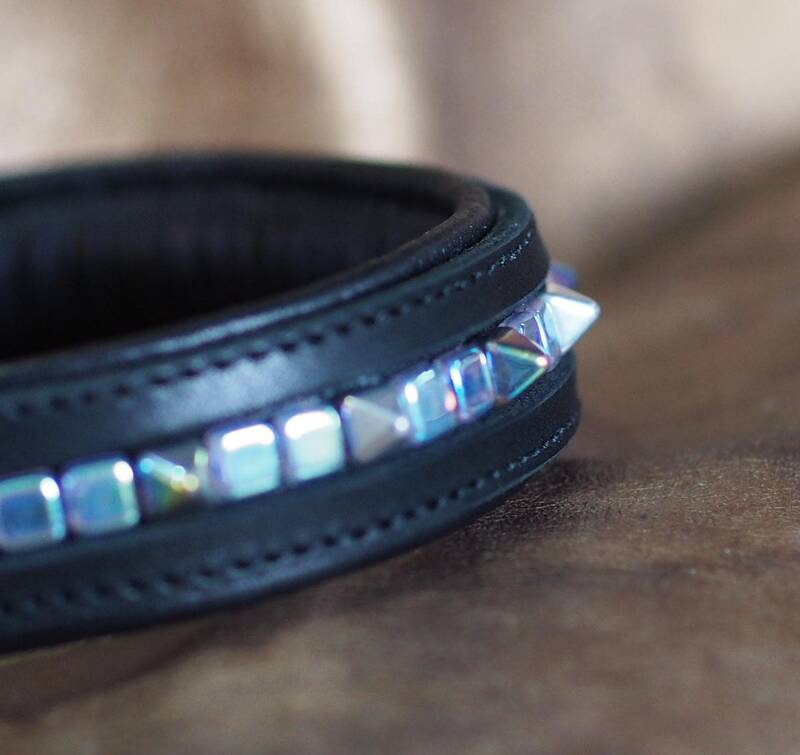 All edges of the main band are beveled and the lambskin is folded for clean finish. 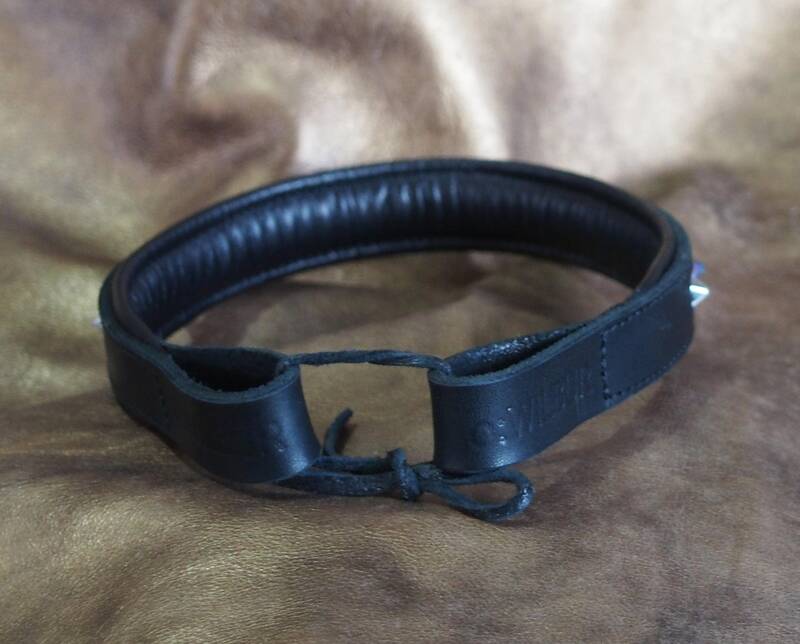 The band will be carefully wrapped and comes with a round wooden box (bottom half is in photos 2 & 5), which can be used to store the band when its not in use, or hold other goodies. The headstall loop has been embossed with my o:WILBUR brand, and size stamp inside. The brow band is presented in a round wooden box, suitable for gift presentation and storage, which has a leather label embossed with my logo and affixed with antique brass rivets.